The body of an evil scientist, Dr. Hader (Jorge Rado), is stolen by a band of zombies. Blue Demon fresh off of a wrestling match, decides to investigate. He finds the monsters have revived the mad doctor, just before he is captured and duplicated. He's sent off to help resurrect a whole gang of creatures including, Dracula and the Wolfman. Once they are gathered, Dr. Hader sends them all off to kill and maim anyone they can find. Only El Santo stands in their way. 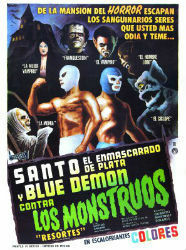 Santo and Blue Demon Against the Monsters is the Destroy All Monsters (1968) of the Santo series, featuring a good half-dozen monsters for Santo and Blue Demon to wrestle (or hit with a mace). I think it’s no small coincidence that the Godzilla led kaiju mash-up came out just a year prior. This is perhaps the height of silliness for the series, which is no small statement to make. 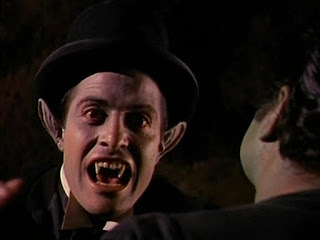 True to form though, no matter how cheap the monster costume, or how much the Mummy looks like John Carradine after a skiing accident, everything is treated with absolute seriousness. This is first Santo film I’ve reviewed that included a team-up with Santo and Blue Demon. Rivals in the ring, and at best, distant acquaintances outside of it, they none the less make a fun team. 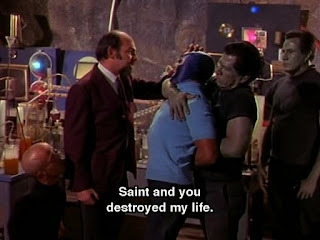 It’s too bad that Blue Demon gets cloned and becomes a pawn of Dr. Hader early into the story, just so that he and Santo have an excuse to fight. They both have a natural charisma that makes them interesting to watch, but Blue Demon is much better at selling action on camera. I initially attributed this to a difference in age but Santo would have been around 53 years old for this film, and Blue Demon only five years his junior. Things you say after deciding to review luchador movies all summer. The monsters themselves are a motley crew: a rail-thin Dracula who likes to leap off of things, Frankenstein’s Monster with a soul patch, a sabre-tooth Wolfman, the aforementioned Carradine-esque Mummy, a thing that I guess is supposed to be a Cyclops, a hump-backed little person with an attitude problem, and a weird alien with a big brain who just stands around. Despite their questionable appearances, the movie never skimps on showing them in action. With little plot to get in the way, we are treated to scenes of Santo taking on whole rooms filled with monsters. Here is where the series comes close to embodying the platonic ideal of wrestling/monster mayhem that a luchador movie conjures up. 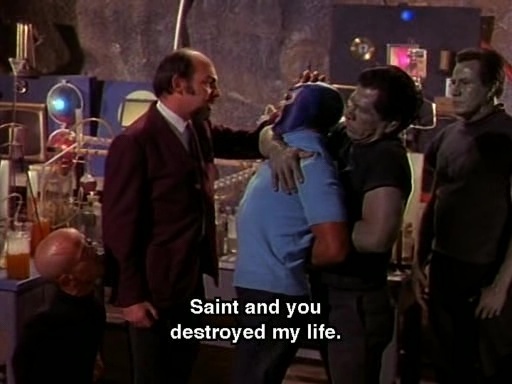 Santo and Blue Demon Against the Monsters confines the usually laborious wrestling matches to the beginning with some rarely seen female luchadors, and later where the match (gasp) actually has something to do with the plot. Sure, there is a long musical number from another film slapped in the middle of the story, but for a Santo film, Against the Monsters keeps up the action and is one of the most entertaining entries yet.